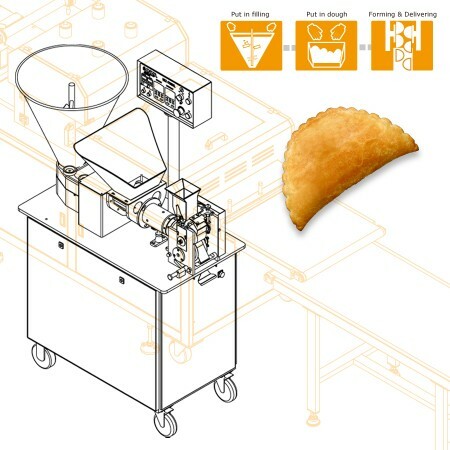 Calzone Machine and Equipment - ANKO High Efficiency Calzone Production Equipment Design | ANKO FOOD MACHINE CO., LTD.
ANKO's encrusting and filling machine model HLT- series are designed and modified to produce calzone. After loading the tanks with fillings and dough, with special molds attached, the machine can produce calzone automatically. After baking, the final products taste similar to handmade calzones. Moreover, by using different molds, the machine is able to produce dumplings, soup dumplings and various other products. Pizza and the stuffed oven bread – calzone are both products of Naples, in the Southern part of Italy. The name calzone derives from “calza” means a long stocking, however, it's a portable meal by itself. Calzone is often stuffed with cheeses, cured meats, tomatoes and vegetable fillings, then folded and baked in the oven. There's also fried calzone to be found with various other similar creations in other parts of the world, often infused with differences in the cultural tastes and preferences. The machines listed below are designed for making Calzone. Please feel free to contact us via the form below. We will happy to answer any questions you may have regarding our products, services, and turnkey projects.